Notre Dame cathedral, in Paris, France, has, at its core, a vast open room called a “nave.” This comes from the Latin world navis, meaning “ship.” If you imagine the shape of its great ceiling from the inside, curving upwards from each wall to a point, you can imagine the hull of a great seaworthy vessel. This is no accident. This architectural feature was designed to signify a poetic and hopeful reality—that we are all in this together. Where life (and death), as unpredictable as oceans, would toss us about and surely drown us if we set out alone, we can fair these open seas together. Notre Dame had, at its peak, a great spire—delicately adorned, stretching into the skies. At its highest point sat a cross, its intersecting lines symbolizing, among other things, the intersecting descent of God into our lives, and the earthbound human condition that unites us all. This is no accident. It was held high as an encouragement to Paris, and the world, to keep aspiring towards faith, hope, and love—and as a reminder to Christians and, as the Catholic liturgy states, people “of good will” that all of us are equal in our need for Love and Mercy. This Cathedral, in its physical being, at its core and at its peak, bears the good news that we are at our best, our greatest, when we are most humble, most bonded, and most given to one another. Notre Dame. Photo by Julian Fong / CC BY-SA 2.0. As a Catholic, this building bears an immense amount of spiritual significance to me. As an artist, it holds a place of privilege due to the awe it strikes with its beauty, age, scale, and detail. Engineers, historians, theologians, authors, and musicians have connected to the Cathedral over the centuries. Losing this treasure, in part or in full, is heartbreaking for us all. It is a unique moment, but not entirely. It is not the first ancient site of faith to fall in our lifetime—less than two years ago, the al-Nuri mosque in Iraq fell, a beacon of Muslim faith ruined by ISIS violence. In recent years, the pain of cultural loss and the falling of our symbols of civilization has been shared by East and West, by every ideological and religious group. At the same time that I grieve this destruction, I feel a thrill of hope. I see statements by Catholics, Muslims, and Protestants, by world leaders from Emmanuel Macron to President Trump, and ordinary twitter users—all sharing a common sorrow. A sorrow founded on an appreciation of this building’s value—not as a piece of real estate but as a physical marker of the spiritual and cultural good news the building has always stood to proclaim. Not as a monument of superiority, but of the beauty of grace and kinship. Yet, there is a temptation lurking. We are human after all. We have an awfully hard time accepting pain without someone to blame. We want to know how this has happened and even as we wait, some of us prepare ourselves for a counterattack. Rumors are being spread, boogeymen invoked, conspiracies crowdsourced. But one thing in this world that will always be more beautiful than buildings—is the people for whom they are built. So, instead of waiting in suspicion, can we prepare our hearts for love? Can we stoke, in our selves, purifying flames of mercy? They say, “hope for the best and prepare for the worst.” But what if preparing for the worst could mean preparing to mount a response of faith, hope—and above all, of love? May our response to this tragic loss, at its core and at its peak, bear the spirit of the Cathedral herself. 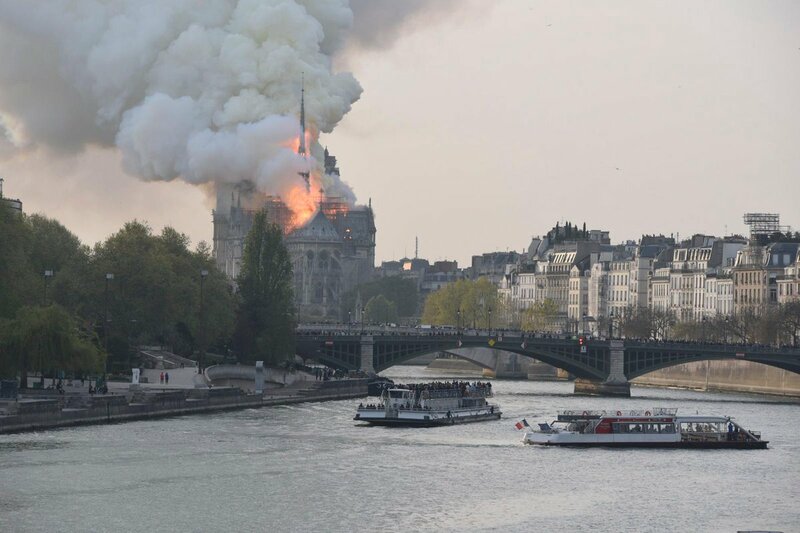 Notre Dame has burned, our ship has sunk, her spire fallen. May our love burn brighter, our nations bond, and our spirits rise. Notre-Dame de Paris, je t’aime!